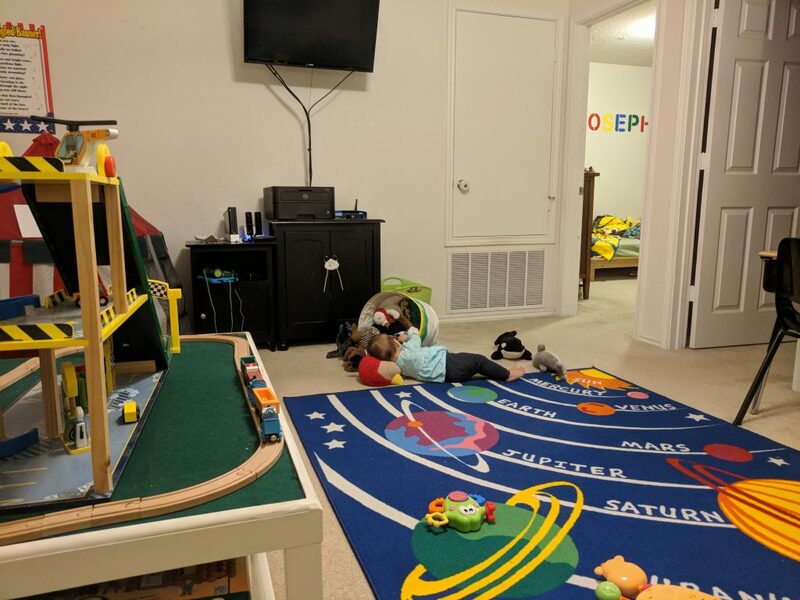 Weekly Happenings: We enjoyed a relatively relaxed week this past week. Joseph had the week off, we had a quiet Thanksgiving at home with just our little family, and we tucked away the fall decorations to make way for Christmas stuff. I love this time of year! The Weekly Weather: It’s been warm-ish…mid- to upper-70s with a couple days in the low 80s. What Paul’s Been Up To: He’s been really busy with school work (and his day job, of course). 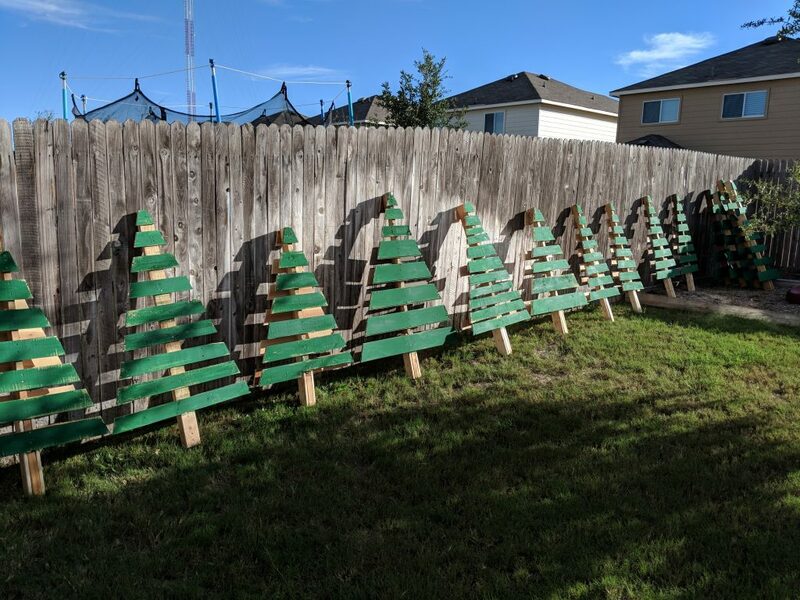 He also pounded out a lot of Christmas trees made out of wood pallets to use as decorations for the entrances to the neighborhood and he (with the help of some others in the neighborhood) spent yesterday morning decorating each entrance. What Sarah’s Been Up To: Not too much out of the ordinary for me. While Paul tackled the outside house decorations, Joseph and I tackled the inside. So much fun! What Joseph’s Been Up To: He enjoyed his week off (5:30 tomorrow morning might be a shock). He’s been excited about getting Christmas stuff out, so Friday was a lot of fun for him. 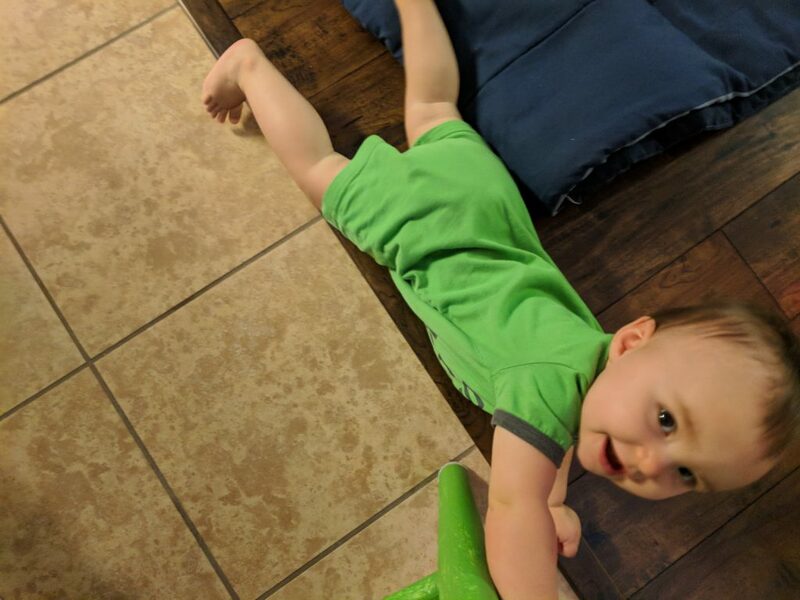 What Abigail’s Been Up To: Ever since the Christmas tree went up, her crawling efforts have increased, ten-fold, haha. She is a super-busy baby and also likes to play peek-a-boo with me by putting the burp cloth over my face and then pulling it off. 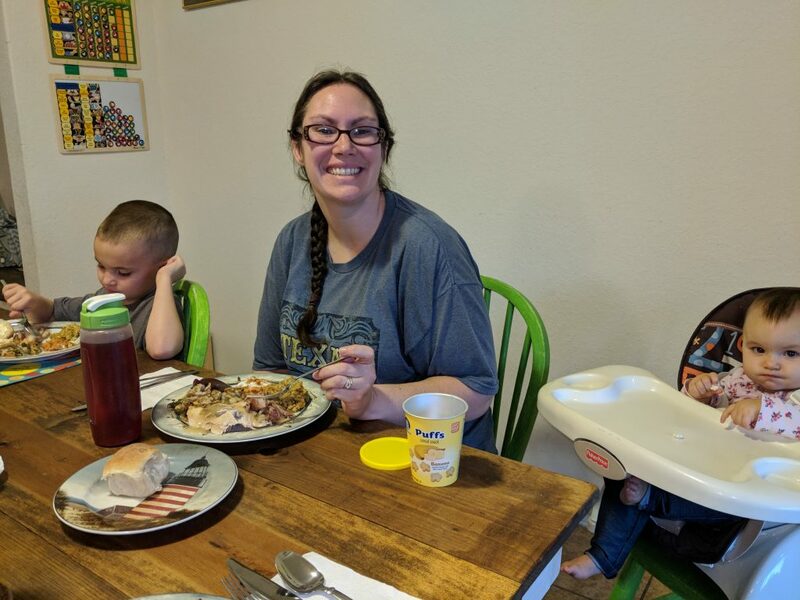 She also has figured out that feeding herself is rather fun and loves to sit with us at dinner, shoveling puff snacks into her mouth as fast as is safely possible, haha. 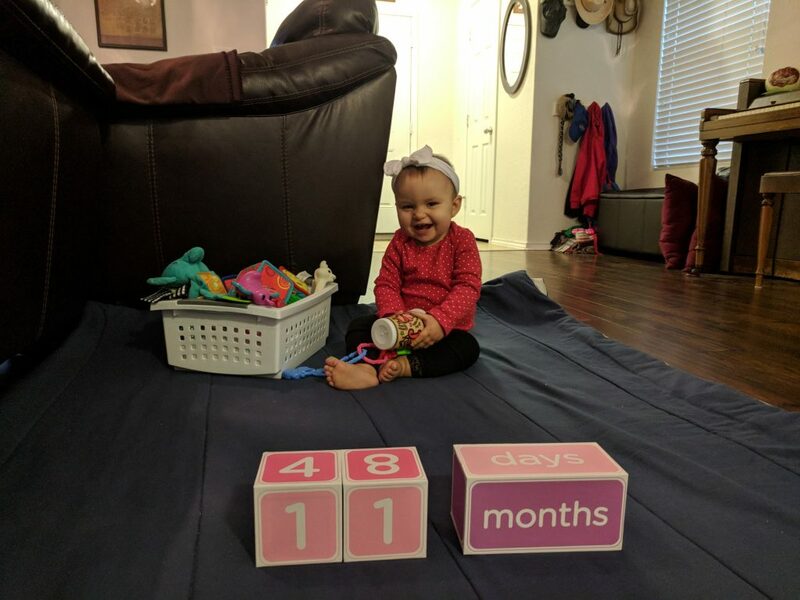 She hit her 11 month mark mid-week last week, which just blows my mind. I can’t believe she’s so big! 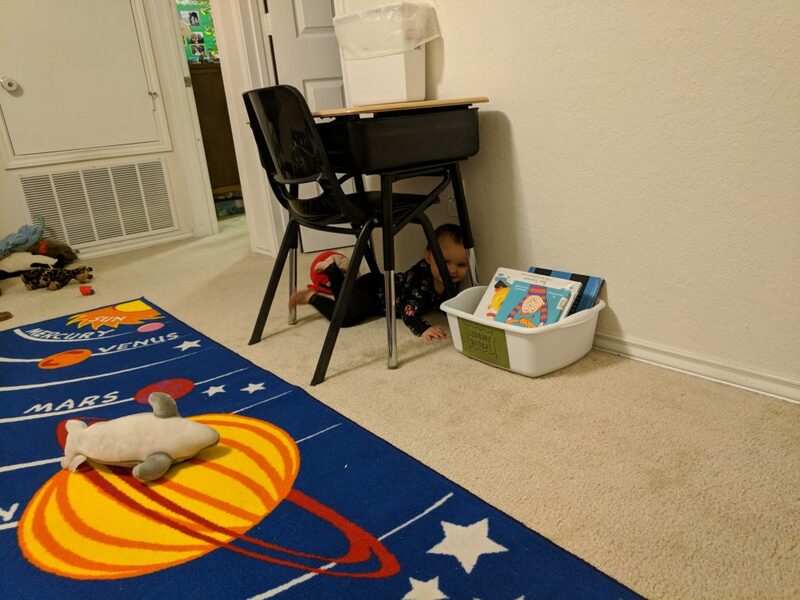 “Stuck” under Joseph’s desk, but not really minding a bit. 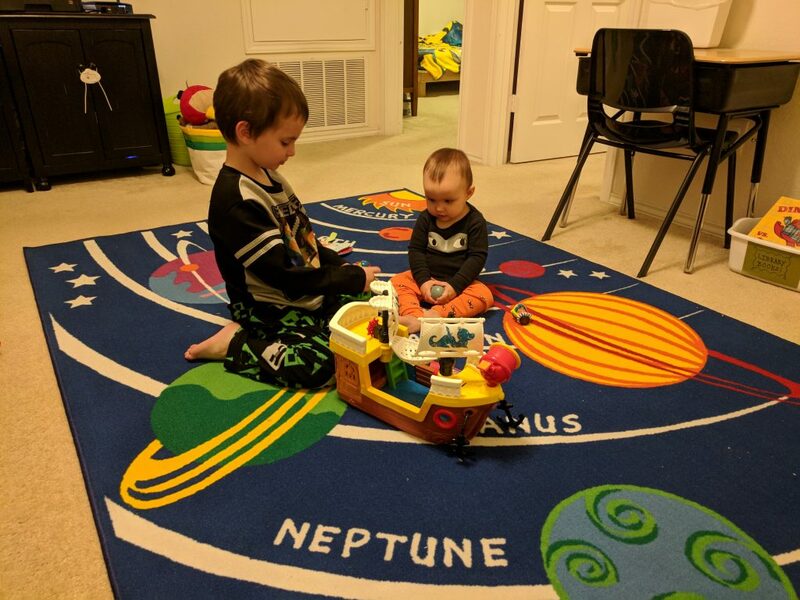 These two absolutely love hanging out together. Attacking the stuffed animal bin. 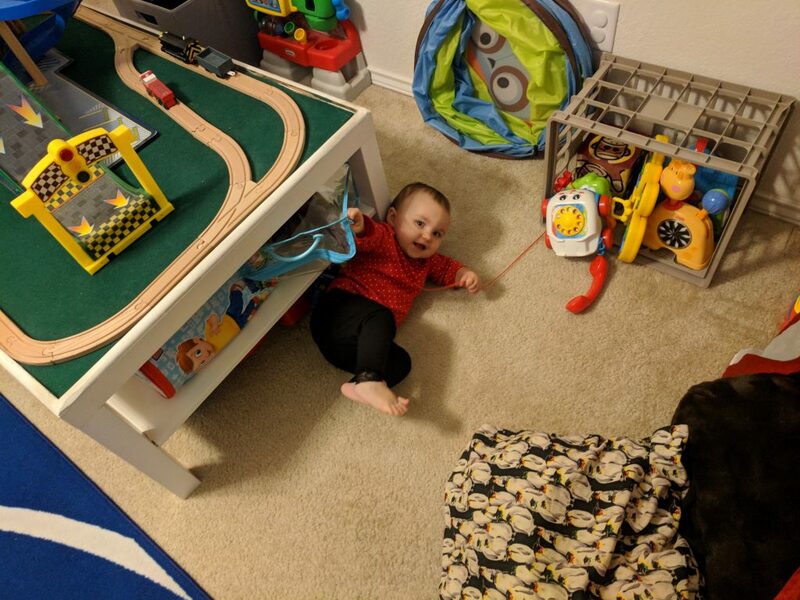 Caught in the act of beginning to spread toys all around. 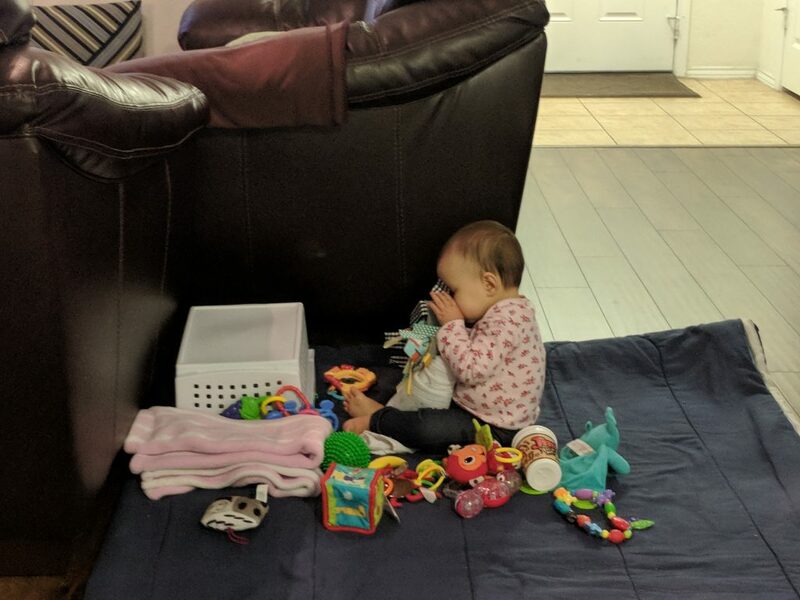 She’s such a busy baby! 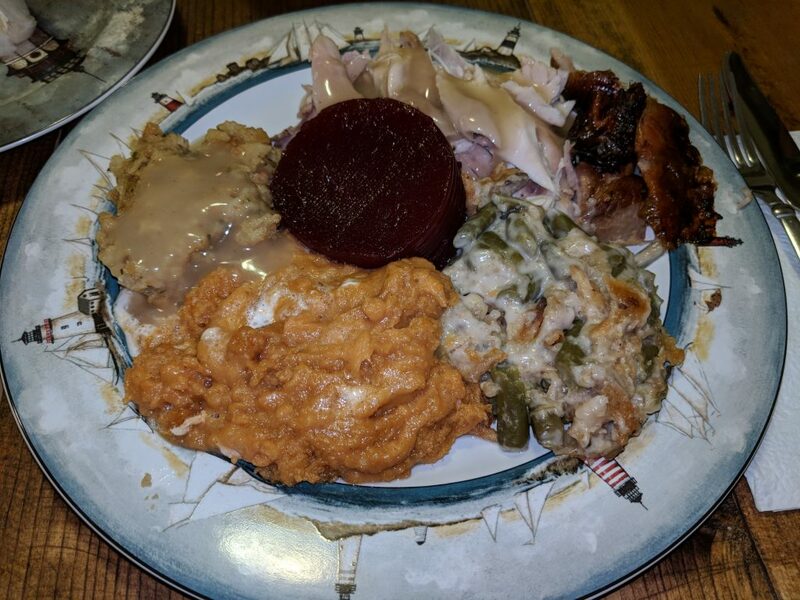 Our yummy Thanksgiving feast. Paul was in charge of the turkey (he smoked it on the grill) while I attacked the sides. Our “baby-resistant” (because is it ever really baby-proof?) 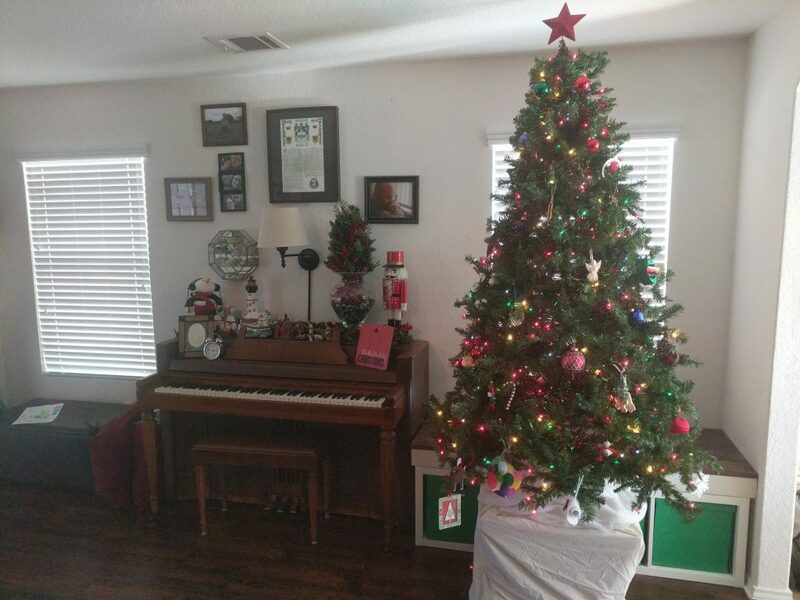 solution for the tree (which started when Joseph was a baby). 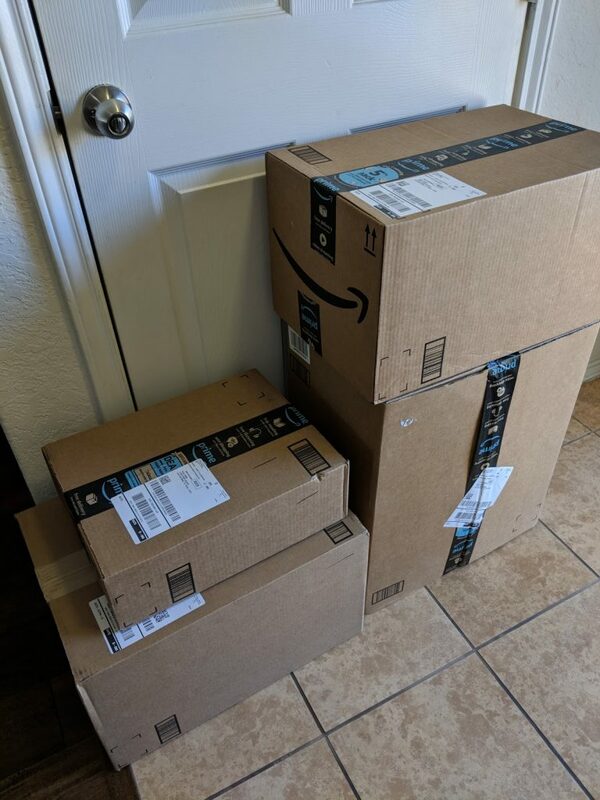 Paul’s version of Black Friday shopping: gifts for me and the kids that were actually delivered on Friday. 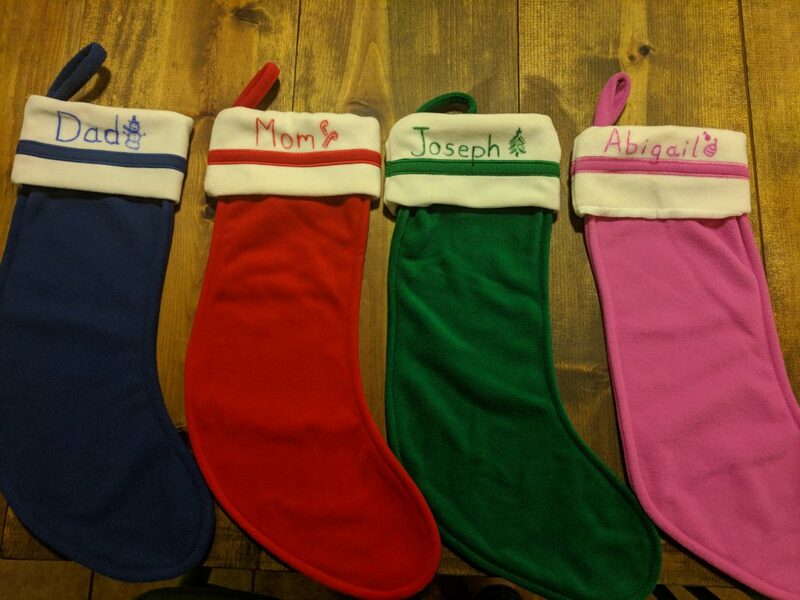 Since we couldn’t find a stocking for Abigail that matched our old ones, we opted to replace everyone’s stockings. Joseph helped me come up with the ideas of what picture to draw on each stocking (after he saw the tree I drew on his). He wanted a Christmas item that matched the color of each stocking, so Paul’s has a snowman, mine has candy canes, his has a Christmas tree, and Abigail’s has ornaments. 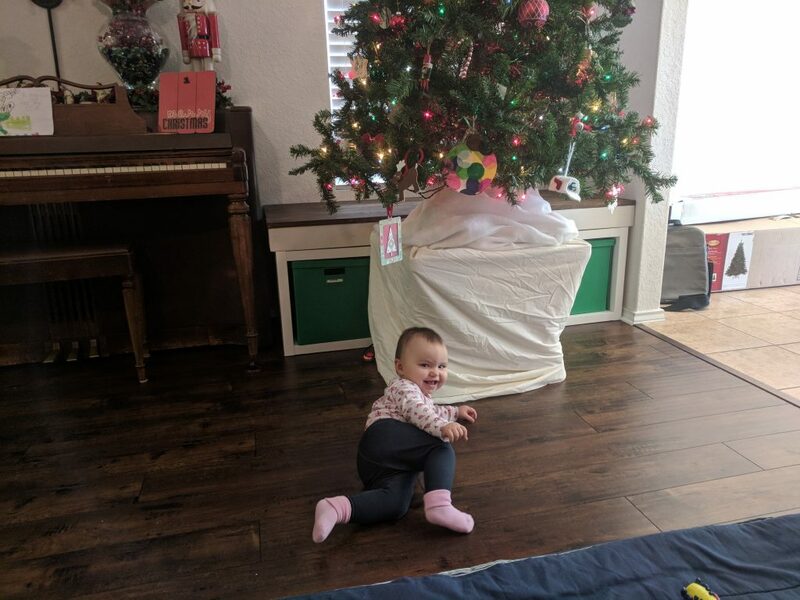 Like I mentioned before, the presence of the tree has greatly encouraged her to start crawling even more. 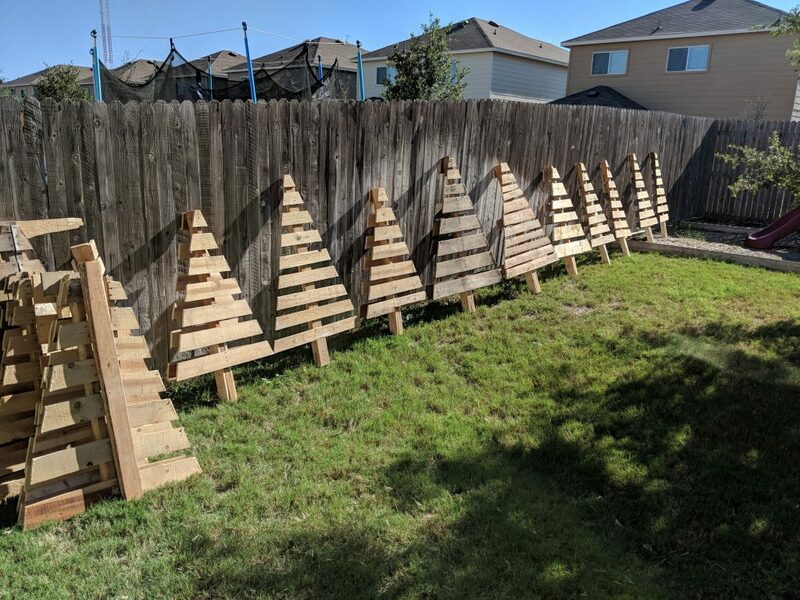 The beginning of the pallet Christmas trees (after he cut the pallets into triangles and attached trunk made from 2x4s). Lights attached, bows on top, and spotlighted. 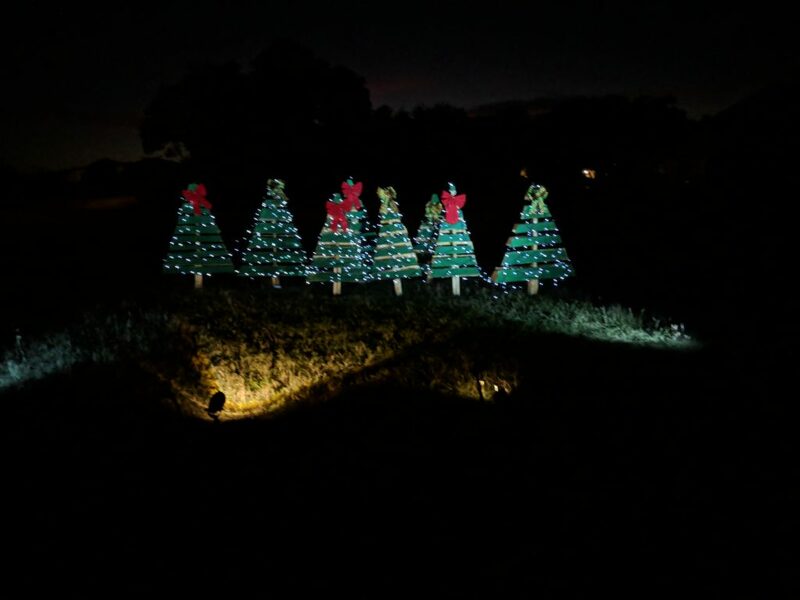 The neat thing about this picture is that since there isn’t any electricity at this particular entrance (the other entrances have signs with spotlights, so they have electricity), Paul got the idea to find spotlights and Christmas lights that could be attached to solar panels. Wahoo! Someone decided to come and say hello to me as I had my breakfast.